In October 2015, terrible fires swept over Borneo and Sumatra – the worst ever worldwide. This Saturday you can do a good deed and have trees planted there just by partying. All you have to do is come to WesterUnie, get some drinks and enjoy the unforgettable night promised by Monkey Business with an amazing line up of DJs. The worst fires worldwide occurred in Borneo and Sumatra, carrying away with them all the trees away. You can give a hand and help them to build it again! 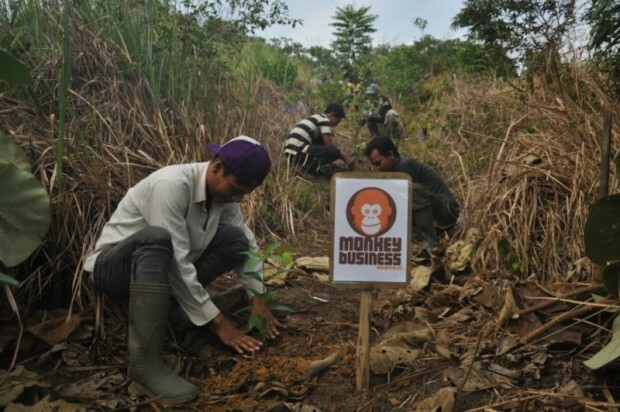 With the proceeds from Het Oerwoudt, 20.000 new trees could be planted by Monkey Business on Sumatra in order to restore the rain forest. Last year’s event permitted to plant 7.000 new trees. Packed with the most beautiful decorations, artists, a lot of blacklight and the music; you’ll be delighted. DJs such as Cleavage, Arjuna Schiks, Bram Fidder, Eric de Man and Geus Beats & Kidmalone will make you move. Also, a special blacklight jungle filled with decorations will bring you in tropical areas for one night, with 3D art, live art and more. And all proceeds go to the protection of the rainforest of Sumatra! There is still a lot left, but we support this charity event, our contribution to the restoration of the rainforest. Check out the teaser video, or last year’s after movie. Step out of your comfort zone, let all good intentions aside, and immerge in an amazing tropical rainforest!